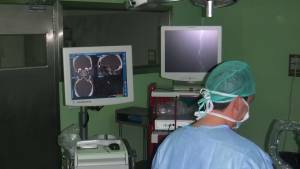 (2)Department of Otolaryngology, Hospital General Universitario Alicante. Supine position with the trunk raised 10º and the head in neutral position rotated 10º towards the surgeon. The head is secured in a horse-shoe headrest without rigid three-pin fixation. The nose is prepared by placing pledgets soaked with 0.02% of Oxymetazoline into each nostril, followed by Povidone Iodine solution applied over the nose and upper lip as well as into the nares with cotton tip applicators. We use the neuronavigator based on CT-angiography during the standard endoscopic approach, especially useful in the presence of a conchal type sphenoid sinus and in certain cases of recurrences with a previous history of transsphenoidal surgery or in patients with a large lesions involving the para-suprasellar areas. The most commonly used endoscope is a rigid 0º direction of view with a 4 mm (0.15”) tube diameter and 180 mm (7”) of length. 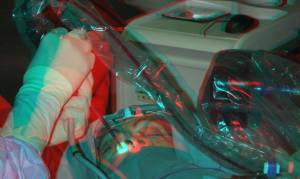 During the sphenoidal stage, the endoscope is held dynamically by a second surgeon, meanwhile the first surgeon is able to operate two instruments with both hands. Left nasal cavity view. The nasal stage can be prepared in both sides depending on anatomical difficulties like anatomical variations or previous surgeries. First of all we lateralize the middle turbinate to make sure that the surgical pathway is wide enough. Thus we find the spheno-etmoidal recess, the ostium of sphenoid sinus and the choana. Left nasal cavity view. We recommend removing the middle turbinate from the nasal cavity at the site where the flap is going to be made, increasing the surgical pathway. Right nasal cavity view. Middle turbinate removed at the level of the operculum. Left nasal cavity view. The nasoseptal flap has been prepared and hidden into the right choana. The flap is constructed including the mucous membrane of the septum preserving a vascularized pedicle wich takes place between the ostium and the choanal arch. 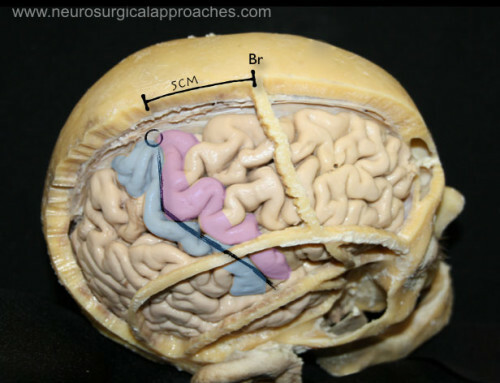 Branches of the sphenopalatine artery are responsible of the flap’s vascularization. Later, the posterior third of the septum is removed in order to allow a wide perspective of the sphenoid rostrum. 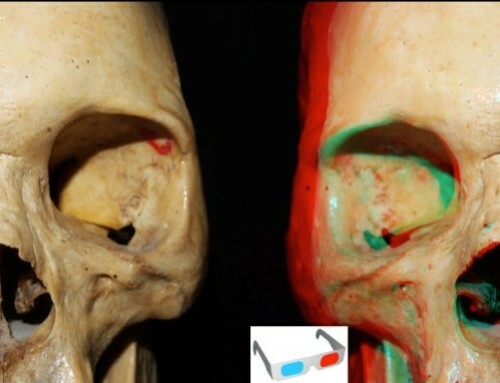 This image shows better the relationship between the ostium and the superior-supreme turbinate. Afterward we proceed to make the sphenoidotomy. We prefer to start widening both sphenoid ostiums with a Kerrison forceps and then drill the rest of the rostrum. Before the appearance of the neuronavigator the rostrum has been a useful point of reference to maintain the correct midline orientation. 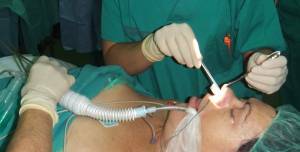 Nasal overview showing the right middle turbinectomy, the resection of the posterior third of the septum and the sphenoidotomy. The nasoseptal flap has been removed to allow a better anatomical vision of both choanas. Opening of the sphenoidal sinus. Intrasphenoidal septum has been preserved. Most of the intrasphenoidal septum are inserted at the parasellar or paraclival carotid prominence. 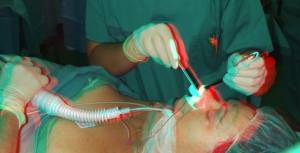 Therefore, extreme care should be taken intraoperatively when identifying and removing these septum´s. Intrasphenoidal view. Critical bone landmarks must be recognize. Sometimes it is difficult to recognized them, especially with poorly pneumatized sinuses as in this case. We must identify the sellar floor, the tuberculum sellae and the relationship between internal carotid arteries (the right artery area highlighted in pink) and the optic nerves (the right nerve marked with discontinuous lines). This anatomical relationship establishes two important areas, the medial optic-carotid recess ( * ) and the lateral optic-carotid recess ( * * ). The first recess mentioned is known as the key-hole of this approach because it is the point of junction of the pituitary gland, the carotid artery and the optic nerve. 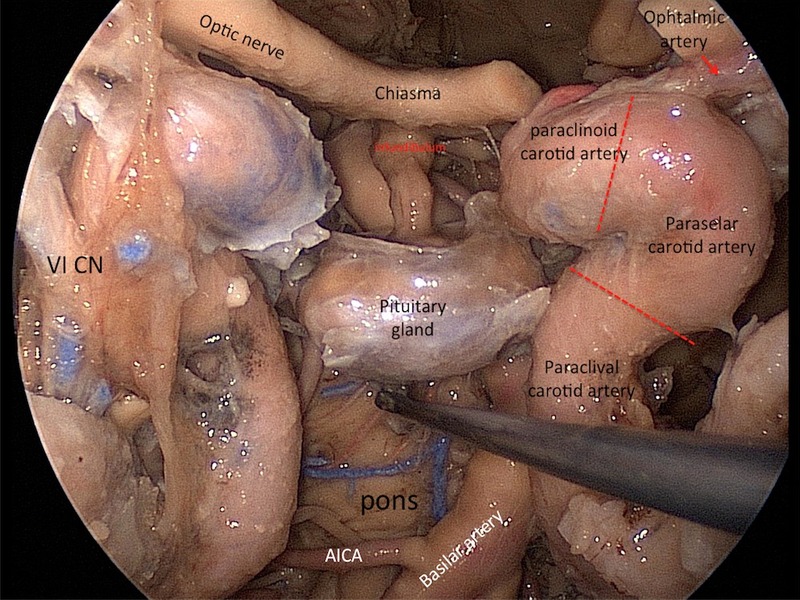 Intrasphenoidal view after the resection of the sphenoid septations. It is important to achieve a wide sphenoidotomy in order to improve the recognition of critical landmarks. At this stage, a four hand instrumental management through both nostrils may be started. If the target of the surgery is a small pituitary tumor we just need the sellar floor opened. This can be performed with a drill or with a Kerrison forceps, exposing the dura mater of the sellar floor. If we need to manage a wider surgical window, the medial side of the cavernous sinus should be exposed. In this picture we show the resection of the middle clinoid on its right side. Sometimes this structure is not identified. We have to distinguish the medial optic-carotid recess placed a little bit more anterior. This picture shows a wider exposure of the sellar and parsellar areas. On the right parasellar area, the cavernous sinus with preserved dura is exposed. In the opposite side, the dura mater is removed and the carotid artery can be observed in red. Sometimes the tuberculum sellae must be drilled in order to improve the suprasellar access in macroadenomas with a great suprasellar component. The area of the planum sphenoidale has been delimited with discontinuous lines. Note the lateral optic-carotid recess and its relationship with the carotid arteries and the optic nerves. The dura mater is opened using a sickle knife in the center of the sellar face. The opening is extended caudally and obliquely toward the 8- and 5-o’clock positions, creating the inferior flap of the opening. The superior flap is left intact to act as a retractor and hold the anterior face of the tumor overlying the diaphragma. In the case of a macroadenoma, the tumor will herniate through this inferior opening. After the dural opening, some pieces of tumor are extracted and sent for histophatologic analysis. 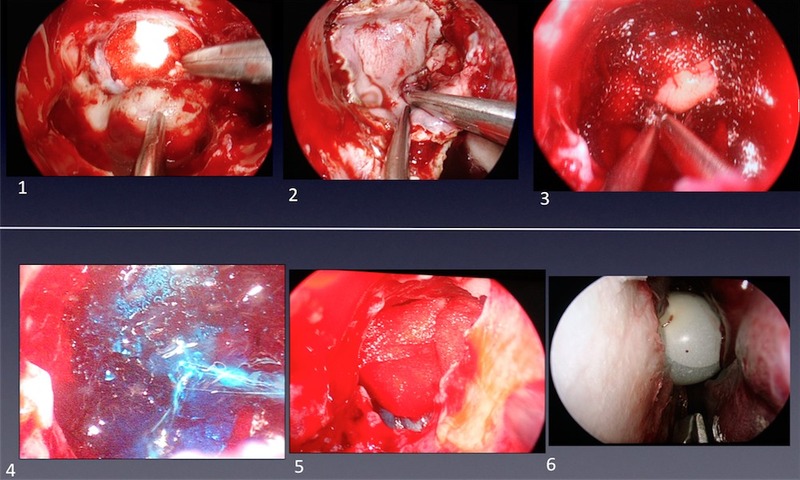 An intracapusular debulking of the tumor is mandatory in macroadenomas in order to improve the mobilization of the tumor and facilitate its extracapsular dissection. (1,2,3) In this example, we try to open the dura preserving the tumor capsule. Extracapsular dissection for pituitary tumors is usually not possible. 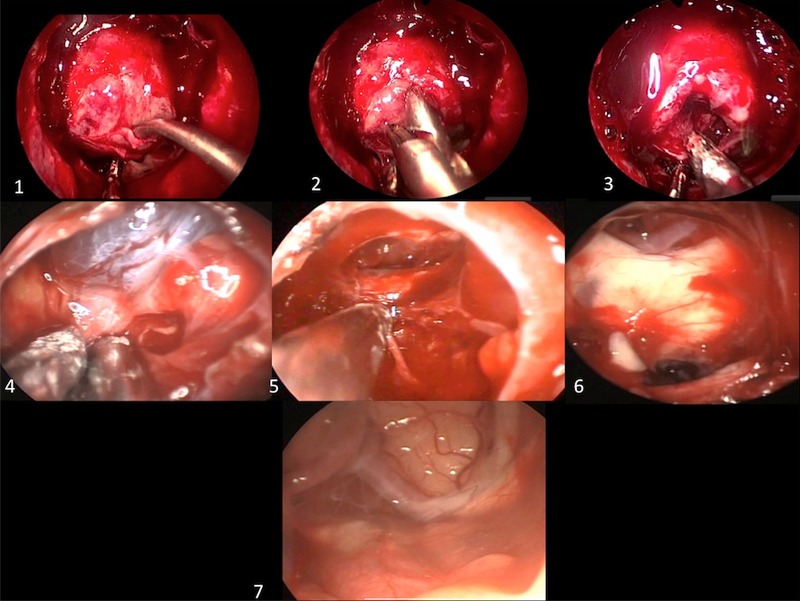 Debulking using two suctions or an expanded endonasal ultrasonic aspirator provides better control an removal with an improved and less traumatic separation of the tumor from the healthy gland, the stalk, and the cavernous sinus contents. (4) Whenever its possible the resection of pituitary tumors should be done extracapsular providing a more effective and safe alternative compared to the traditional intracapsular technique, removes more tumor and has lower remission and recurrence rate. The picture shows the dissection between the tumor and the arachnoidal tissue. (5) Sellar cavity with the tumor removed. Over the sella, the diaphragm has been enlarged by the growth of the tumor. (6) With a 45º angled endoscope the neurovascular structures of the supraselar cistern may be observed. Observing from anterior to posterior structures: anterior communicating complex, the chiasm and the floor of the third ventricle opened. (7) This is a view of the suprasellar neurovascular structures from the sellar floor with a 45º endoscope during an arachnoid cyst fenestration. The frontal lobe, the anterior communicating complex, the chiasm and even the left olfatory nerve may be identified through the arachnoid. 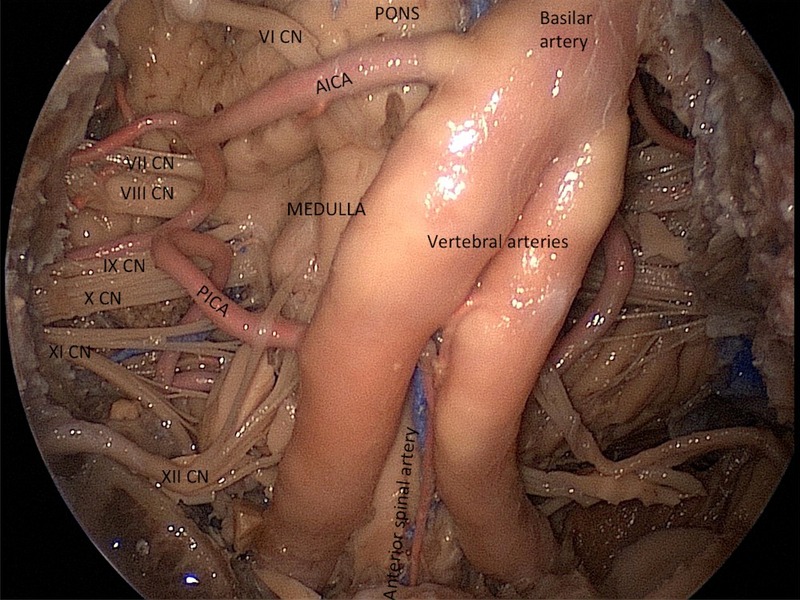 Neurovascular structures are exposed after sellar and parasellar bone and dural removal. The suprasellar and infradiaphragmatic region are frequent targets for the expanded endonasal approach. This is not a surgical vision, it´s an anatomic view of the suprasellar and retrosellar cisterns. The pituitary gland has been removed in order to expose these areas. Note the relationship between the III cranial nerve, the uncus, the first segment of the posterior cerebral artery (P1) and the superior cerebellar artery. Why does transtentorial herniation cause mydriasis? This image shows us the answer. The floor of the third ventricle is located posterior to the infundibulum and anterior to the mamillary bodies. 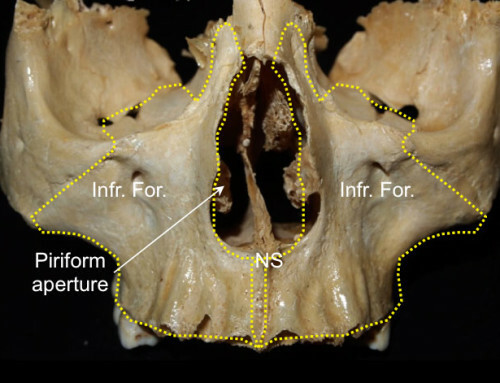 Wide exposition of the skull base anatomy provided by the expanded endonasal endoscopic approach (EEA). Both carotid arteries are being exposed from the lacerum to the paraclinoid segments. For endoscopic endonasal surgeries, an accepted segmentary division of the carotid artery is as shown with the red discontinuous lines. Note the posterior and anterior loops of the carotid artery. The point where both vessels are closest to each other it´s the paraclinoid segment. The retroclival region contains the prepontine cistern and the basilar artery. The pituitary gland has been lowered and posteriorly transposed. For the retrosellar approaches, a superior and anterior transposition is needed. 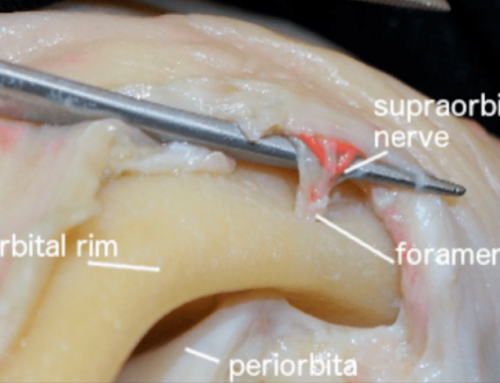 The anterior surface of the posterior fossa and the cerebellopontine angles can be exposed after removing the clivus and the retroclival dura mater. This step is very important in order to avoid CSF leakage. 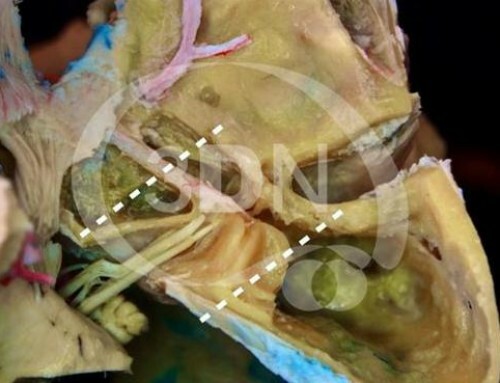 The reconstruction of the skull base defects after EEA´s follows the same principles and goals of the reconstruction of other external approaches; this is to recreate a barrier between the arachnoid space and the sinonasal tract. Reconstruction of a small skull base defect has a success rate of over 95%, independent of which tissue or technique (inlay or overlay) is used for the repairment. The use of vascularized tissue flaps does not appear to be critical in this cases. EEAs for the resection of the skull base lesions create defects that are compare or in some cases surpass, the size of the defects made with traditional craniofacial resections. 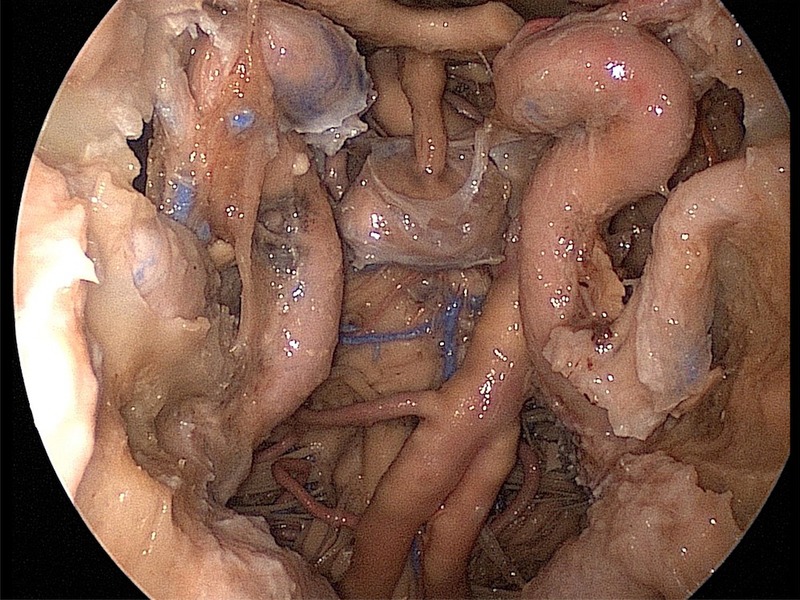 Reconstruction of these defects is a challenge that has limited the expansion of the endoscopic endonasal approaches. 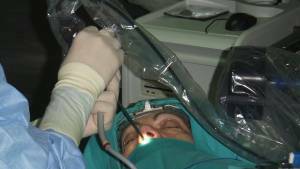 A recent development, the Hadad-Bassagasteguy flap, is a pedicle flap of the nasal septum based on the nasoseptal artery that has overcome this problem in the vast majority of cases. We use this flap, when possible for all EEAs in which we believe are likely to have fistula formation after surgery, thus resulting in a sharp decrease in our incidence of postoperative CSF leaks.